Parashat Vayigash – (pronounced – vah-yee-GOSH) is particularly fascinating to me, as I have a background in economics. Joseph predicted a famine and proposed a program for surviving it in Genesis 41:33-36, when he interpreted Pharaoh’s dream. Joseph’s plan sounded painless: appoint an administrator to gather grain during the years of plenty as a reserve against the years of famine. In the final year of famine, the Egyptians became bondsmen to Pharaoh in exchange for food and seed for the coming year. So by the end of the famine, Joseph had preserved the lives of the Egyptians but at a very high price: every commoner among them was a penniless slave living on land granted by Pharaoh, and additionally paying a heavy tax. Harold Kushner points out in Etz Chayim that a generation later, the Egyptians would take revenge on Joseph by enslaving the Hebrews. Economic policy in the ancient world, as in ours, has both short term and long term consequences. As I write this, children are starving to death in Venezuela, despite it having the largest proven oil reserves in the world. Our Congress is contemplating a tax bill that will be good for big business, on the promise that it will be good for us all. They might want to remember Joseph, whose economic policy seemed wise until the long term consequences caught up with his people. This d’var Torah appeared in a slightly different form in the CCAR Newsletter. 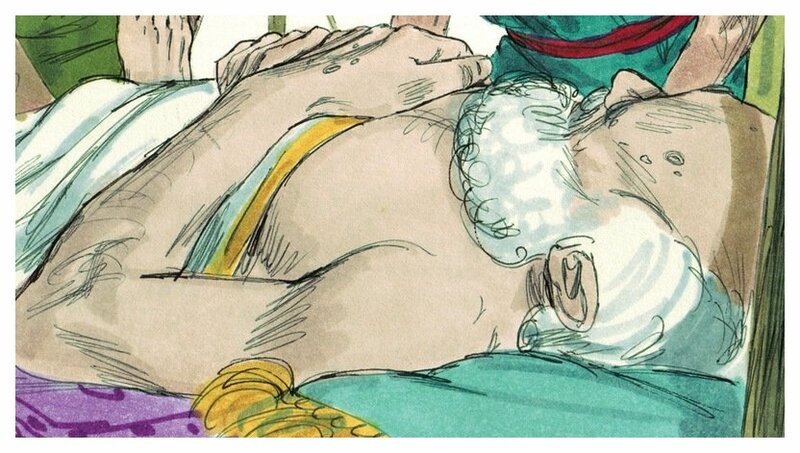 Parashat Vayeshev begins the Joseph story in Genesis, one of the world’s great short novels. It tells us how the descendants of Abraham and Sarah came to be in Egypt. In its own right, it is a complete story. This parashah is only the beginning of the story. It also includes one of the more mysterious elements of the story – another, shorter story, the only one that interrupts the Joseph narrative. That’s the story of Tamar, a woman who stands up for herself. You can read her story in Rabbi Rothschild’s sermon, below. Welcome to the Joseph story. If you feel like you’ve heard it too many times, here’s a tip: notice which character is most attractive to you. Then make an effort to identify with a different character for a while. That initial insight, and the decision to vary it, will vastly enrich your reading. Image: Part of the story of Joseph in the Torah Scroll. Whenever we reach Parashat Vayeshev, this week’s portion, I can taste tuna fish. That may seem like a weird association, but this portion is linked in my heart to the lunchtime study group in which I learned to read Biblical Hebrew. Like most adult learners in the US, my Hebrew studies started with the Aleph-Bet and “Prayer Book Hebrew,” the prayers in the synagogue service. There’s a giant step from knowing what the prayers say to reading the Torah, and Rabbi Steven Chester chose the Joseph story to carry us across that chasm in 1997. Each week we had a short passage to translate. We were supposed to translate the whole thing, but each of us was responsible for “our” verse, meaning that each of us knew ahead of time exactly what we, personally, would translate aloud. We were a group of middle-aged learners, bobbing our heads to find the sweet spot in our progressive lenses in order to see the text. Rabbi Chester was patient and kind, never shaming anyone. That was good, because I had no natural gift for it, and my translations were awful. I would go to class thinking “this CAN’T be right,” and sure enough, it wasn’t. Rabbi used our mistakes to review grammar or to show us (again) how to break down a word to find it in the dictionary. Our glacial pace through the text meant that we studied it deeply, noticing the choices about grammar and the repetition of certain words in the text. It was my first taste of learning a text on that level: word by word, even letter by letter. I was enchanted. Sometimes Rabbi Chester enriched our study by showing us a midrash on a particular scrap of the text. This was also his sneaky way of introducing us to the glories of midrashic texts and rabbinic Hebrew and Aramaic, since he always gave us those texts in both the original and translation. We’d read the translation, but the original words would wink at me, promising more: more meaning, more depth, more nuance. That class marked the beginning of my love for text study. It met Wednesday at lunchtime for years, and now as a teacher myself I marvel at his chutzpah and patience in leading us into that tangle of grammar and vocabulary. It was an unusual and bold way to teach Biblical Hebrew. It was also a brilliant choice, because the powerful current of the narrative kept us going. Who could quit, halfway through that story? By the time we came to the end of Genesis 50, my translations were less ridiculous, and I felt confident enough to tackle other parts of Torah on my own. I learned the most important lesson for Hebrew study: stick with it long enough, and it will begin to sink in. Foolish, feckless Joseph grew up to be a tzaddik, and I had begun to grow towards becoming a rabbi. And every year, when we read this narrative again, it stirs old memories of sitting around a table, munching our lunches and puzzling out the mysteries verse by verse. So… Passover is nearly over. We’re on our way to Sinai, a journey from redemption to responsibility. When Moses and the people of Israel left Egypt, they carried the bones of Joseph with them. (Exodus 13:19) He had requested that they do so when he prophesied that they would someday leave Egypt and go home. (Genesis 50:25) Those bones would wander with the people of Israel for over forty years, until they were finally put to rest in Shechem. (Joshua 24:32) Moses made sure they brought those bones with them because of an ancient promise. Joshua saw to it that the bones were buried in the soil of Shechem to fulfill the promise. Likely the “bones” of Joseph were actually his mummified body in a wooden box. He had been a high official in Pharaoh’s government, so he would have been buried as an Egyptian courtier. Moses took the time and trouble to locate the box and to carry it along, despite the danger, despite the need to move quickly. What would you bring along, if you suddenly had to leave your home on short notice? Photos? Legal papers? A precious antique? The pets? The children’s toys? What if you knew you were going to have to walk hundreds of miles? What would you choose to leave behind? What would be too precious to leave? Passover is almost behind us now. It’s time to look around and say, what practices, what insights am I going to bring along with me, as I walk towards the future? What hurts, what old grudges, what outmoded ideas will I decide to leave behind in Egypt? Image: The beginning of the story of Joseph in the Torah Scroll. The Joseph story has its own place in my heart. I have always felt a strong connection to the powerful novella that closes out the book of Genesis. That connection was strengthened when my rabbi chose it to use as our text for learning Biblical Hebrew. Like most adult learners in the US, my Hebrew studies had started with “Prayer Book Hebrew,” the prayers in the synagogue service. There’s a giant step from knowing what the prayers say to reading the Torah, and Rabbi Steven Chester chose the Joseph story to carry us across that chasm. Each week we had a short passage to translate, divided among the members of the class. We were supposed to translate the whole thing, but each of us was responsible for “our” verses, meaning that each of us knew ahead of time which verses we, personally, would translate aloud. Rabbi Chester was patient and kind, never shaming anyone. That was good, because I had no natural gift for it, and my translations were often a mess. I would go to class thinking “this CAN’T be right,” and sure enough, it wasn’t. But he always knew if we’d cheated, so it was better to bring what I had translated, even if it was obviously wrong. He’d use our mistakes to review grammar or review how to break down a verb to find it in the dictionary. Our glacial pace through the text meant that we studied it deeply, noticing the choices about grammar and the repetition of certain words in the text. It was my first taste of learning a text on that level, word by word in Hebrew. Sometimes our teacher enriched our study by showing us a midrash on a particular scrap of the text. This was also his sneaky way of introducing us to the glories of midrashic texts and rabbinic Hebrew and Aramaic, since he always gave us those texts in both the original and translation. We’d read the translation, but the original words would wink at me, promising more: more meaning, more depth, more nuance. Foolish, feckless Joseph grew up to be a tzaddik, and I had begun to grow into a rabbi. And every year, when we read this narrative again, it stirs old memories of sitting around a table, munching our lunches and puzzling out the mysteries verse by verse. This post was given as a sermon at Congregation Ner Tamid in Henderson, Nevada on December 12, 2014, Shabbat Vayeshev. The sermon begins at 1.01.05. Was there ever been a time in your life when you felt utterly abandoned by everyone? A time when you felt that the people you depended on had failed you, or turned on you? When you had no friends at all, and you were in awful trouble? Maybe you have been fortunate, and have never had that experience. If that’s the case, I ask you to imagine it. That’s exactly the situation our ancestor Joseph is in at the end of this week’s Torah portion. He is sitting in prison. His brothers debated killing him, and instead sold him into slavery. He managed to rise to a position of trust in the household of an important man, and his employer’s wife turned on him. He managed to make an influential friend in prison, and that friend has forgotten him. There is no question that Joseph started out as a foolish young man. He was spoiled by his father. When at age 17 he went to his father to tattle on his brothers, Jacob did not teach him about lashon harah. He did not teach Joseph not to talk about others. Instead, Jacob gave him a fancy coat. Joseph was so naive that it never occurred to him that his brothers’ hatred was serious business. Those who should have taught him and protected him failed him again and again: His father did not teach him. His brothers turned on him in anger. And let’s face it, the boy seems to have been pretty clueless. So he winds up in Egypt, a slave. He has one piece of luck: he is purchased by an important man, Potiphar. He rises to a position of trust in the household. But then, because he is young and foolish, because he has no one to advise him, he makes another mistake. Just as he failed to see the danger in his brother’s anger, he fails to see the danger in the desire of Potiphar’s wife. A wiser man would never be alone in the house with her. A wiser man might have made sure there were other servants around at all times. After all, he was the steward of the household! He gave the orders! Instead, he was accused of a terrible crime for which he had no alibi. His master, furious, put him in prison. And there he sat, without friends, without family. He was a foreigner. He had been accused of a terrible crime. He had no way to prove his innocence. Even when he made a friend – Even when it looked like there might be hope, he was forgotten. He had been left to rot. The chapter ends with Joseph in jail, abandoned. The next chapter begins two years later, and Joseph seems to be a different man. As foolish as he had been before, Joseph became wise. The text leaves us to wonder what happened during those two years sitting in Pharaoh’s jail? When there is a gap in the Biblical story we look to Midrash, to the stories of the rabbis to help us understand. Midrash tells us that Joseph spent his time in jail learning. He learned the languages of all the men imprisoned there. who had taught him about the One God who demands that we act with justice and kindness. Became a man who was interested in other people. Became a man who learned languages so that he could understand people. He became a man who reflected not on his own dreams but upon the dreams of others. Joseph the spoiled brat became Yosef Ha-Tzaddik, Joseph the Righteous Man. So what’s the lesson here? What’s the point? One thing we can learn is what to do when, like Joseph, we feel that we have been abandoned by everyone, when everything is hopeless. Instead of focusing on what others have done to us, we can do what Joseph did: we can learn how to listen and how to talk with others. Instead of allowing bitterness to fill our souls, or worse yet, plotting our revenge, we can reflect on a God who commands that we act with justice and kindness. We can learn to let go of “me, me, me” and look beyond ourselves and our own aggrandizement. Torah is often translated “Law” but it is more correctly translated “Teaching.” And what Joseph teaches us, and the Psalmist underlines, is that when we feel that things can get no worse, the best thing we can do is learn. By this I don’t mean “learn our lesson,” although sometimes, that’s one thing we need to do. Rather, I mean something much larger: we need to learn everything we can about how to connect to other people. Because when we are sitting in that lowest place one of the things that has gone wrong is our connections to others. Isaac teaches how to get along with angry neighbors. Jacob teaches us how (and how not to!) deal with our relatives. Learn about ourselves and our mistakes. Learn how to speak and to listen to people different from ourselves. Learn new ways to be with others. For it is by learning that we grow, it is in learning that we expand our horizons. It is in learning that we begin to connect with the world outside ourselves. agents of Torah in the wider world. Posted on December 13, 2014 December 4, 2017 Categories D'var TorahTags Genesis, Joseph4 Comments on Vayeshev: What Changed Joseph?